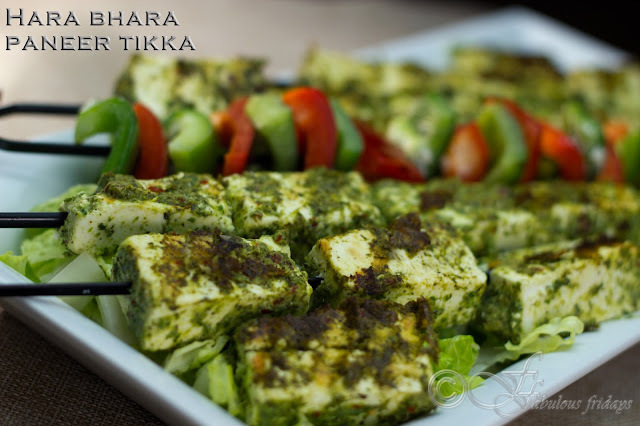 There are many flavorful tikka recipes to suit every taste bud. Hara bhara paneer tikka or haryali paneer tikka is made with an array of herbs and spices and tastes fresh and herbaceous. I use hung yogurt as the base for the marinade. You can also use sour cream if you wish. Grid the green marinade fine using as little water as possible. Place all ingredients under marinade and grind them together into a thick paste using very little water. Almost like making a green chutney. Place the marinade in a large bowl and add hung yogurt and corn starch. Mix to make a smooth paste. 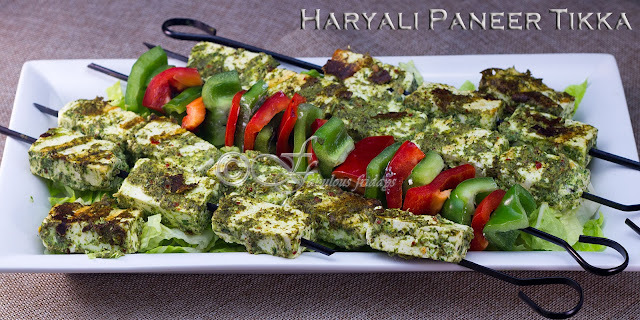 Marinate the paneer cubes in this marinade for 2 hours. If using wooden skewers make sure to soak them first. Place the skewers on the hot grill for 3-4 minutes. Baste with oil or melted butter, turn the skewers and cook for a few more minutes till done. Sprinkle with lime juice and chaat masala (completely optional as they taste great as is).